The organ was made by an anonymous builder in the 1740s. 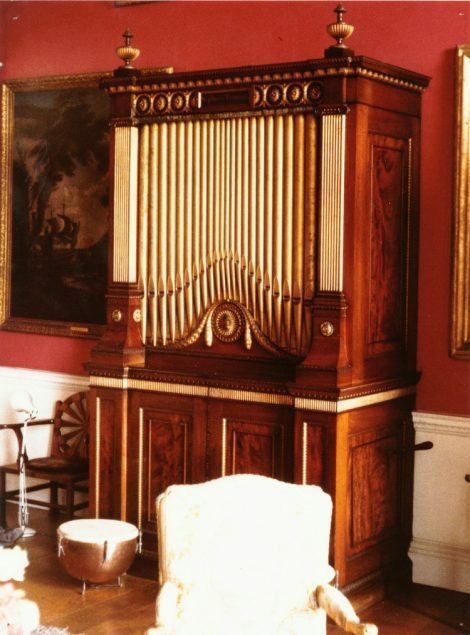 It was sold secondhand to Nathaniel, Lord Curzon in 1765 by John Snetzler, for whose new organ there was no space in the scaled down design for the house. Robert Adam designed a new case to fit around the old case, a somewhat simplified version of the design originally supplied. The organ was not altered. In 1824 Alexander Buckingham visited and made a new horizontal bellows using the leaves of the original bellows. he also raised the pitch slightly, but kept the tuning system. Horizontal bellows 1824, made out of the original leaves.